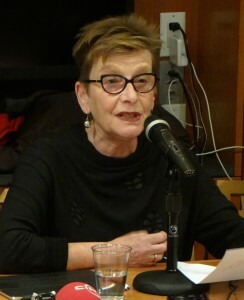 Democracy Now broadcast a clip of Marianne Hirsch, CSSD member and Columbia Professor of English and Comparative Literature, speaking on January 29, 2016, at New York University about state and university actions against academics in Turkey. Representatives from Amnesty International, Scholars at Risk, the Research Institute on Turkey, GIT-North America, Turkish and other U.S. academics and activists spoke out at the Hagop Kevorkian Center for Near Eastern Studies against the investigation, detention, and firing of scholars who initiated a petition asking the government to end curfews in the Kurdish regions of Turkey. View the clip at 8:37 here and the article here. “The international outcry against these state and university actions against academics in Turkey, the multiple petitions that have been signed by thousands of academics around the world, and have spawned numerous solidarity actions such as this one, attest to the gravity of these (official) acts,” said Hirsch in the clip. “I am here to express my shock and dismay at this attack on academic freedom and freedom of expression,” said Hirsch. “Signing a petition is a basic right to free speech and needs to be protected by our universities and our governments, and so must the freedom to demand peace at times of conflict. These are fundamental rights that are at the cornerstone of liberal education and free academic inquiry,” she said. The press conference was also covered by Turkish daily Zaman and the website Cihan. Days earlier, CSSD also signed on to a petition drafted by Scholars at Risk calling on the Turkish government to stop all threats against the signatories of petitions who are exercising their basic rights of free speech.